My favorite Star Wars film of all-time is still The Empire Strikes Back. There’s just something chilling about the middle part of a trilogy that ends on a sour note. The good guys win, kind of. But the bad guys get a victory of their own, and for that 9-year-old boy still inside of me, that ending still haunts me to this day. Plus the fact that AT-ATs are THE coolest vehicles ever and the entire fight on Hoth is amazing and finally meeting Yoda is beyond amazing and… okay, okay. You get the point. I love, love, love everything about the Star Wars Original Trilogy. I also am beyond stoked (not Snoked) about the new trilogy. I loved Star Wars: Episode VII – The Force Awakens. I really thought it was a brilliant way of capturing the feel of the original trilogy, while moving the story forward. And perhaps that’s why I have a feeling I’m going to love the next episode the best in this trilogy. Star Wars: Episode VIII – The Last Jedi is the meat in the ultimate Force-filled trilogy. Just as Empire was full of the Dark Side… I expect The Last Jedi to be even moreso. 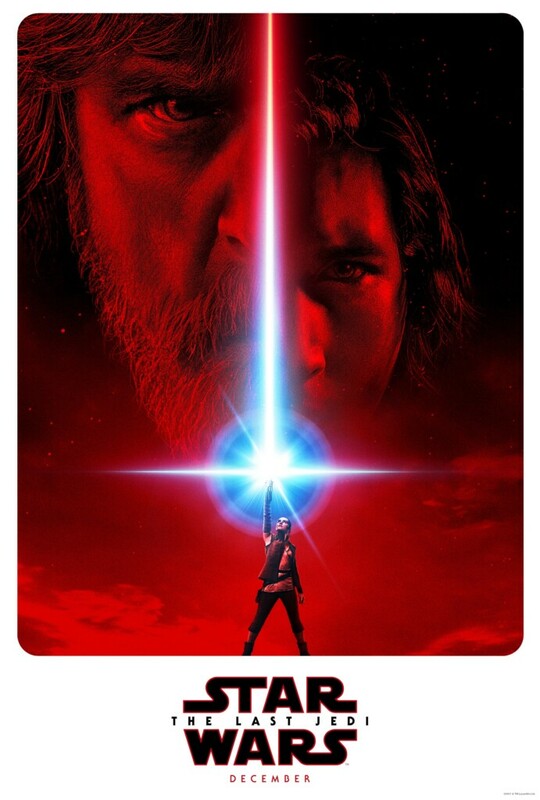 I mean, just take a look at the official movie poster above! You’ve got Rey at the bottom as a beacon of light. Blue light for that matter, thanks to Luke Skywalker’s original lightsaber. But above her, well… the blue turns to the bright red color usually associated with Darth Vader, Darth Maul or Kylo Ren’s lightsaber. Yeah, basically, the bad guys are red. So, um… why is the cheesy farmboy Luke bathed in red?!? He’s the guy who saved the universe from the Empire on more than one occasion. He destroyed the original Death Star. Obliterated Jabba the Hutt. Rebuked The Emperor and actually turned Darth Vader good! What did he ever do that’d show even a glimmer of him turning to the Dark Side? Okay, well anyways, after this poster hit the streets, rumors swirled like Jawas around a droid that Luke was going to turn evil! I hope they’re only rumors, but time will tell. In the meantime, I can’t believe you’re still reading this, since the first official teaser trailer has been released! Pretty darn cool huh? I have sooooo many questions. Questions like…. Photo: Film Frames Industrial Light & Magic/Lucasfilm. ©2017 Lucasfilm Ltd. All Rights Reserved. Why does Rey slam that rock at the beginning? Why is she out of breath? Did she just fall from the sky??? And then there’s the part where she’s standing in front of the water. I can’t tell if it’s just crashing against the rocks or… perhaps she’s using her powers to move it with The Force. After all, Luke’s first big test with The Force in The Empire Strikes Back was when he tried raising his X-Wing Fighter from the swamp. And the Lucasfilm logo is… metallic blue? Isn’t it usually green? That HAS to mean something, right? Right? Apparently that’s General Leia looking at a pretty familiar map. She could be just prepping for another war in the stars, or more likely planning a big surprise party for her twin brother. The planet Crait. Photo: Film Frames Industrial Light & Magic/Lucasfilm. ©2017 Lucasfilm Ltd. All Rights Reserved. I have no clue what kind of ships these are, but I need to buy one. They’re real low to ground though, which makes me think they’re modern versions of the landspeeders. Of course, I have no clue what all that red dust is. Exhaust? Blood? Kool-Aid?!? That soooo does not look good. I’m just guessing here, but that hooded guy has to be Luke, right? He’s with his buddy R2-D2 and there’s pretty much death, destruction and fire all around him. That means either Luke ventured off the island (which he probably did, since he’s now with R2), or the First Order has found him! Speaking of Luke, I’m 99% sure that photo is of him looking back into a cave. The hood, the beard and the beautiful lush island behind him are pretty much a giveaway. But then why does he say, “It’s time for the Jedi to end”? Okay, so the voice sounds a bit like Kylo Ren, but the last part of the sentence (“to end”) clearly shows Luke mouthing those words. Am I crazy? Is that actually Kylo? Has Luke finally turned to the Dark Side?!?!? Do I need to get some sleep? All I know is that we’re only going to be faced with loads more questions before answers, since The Last Jedi doesn’t hit theaters until December. In the meantime, us geeks will continued to do what we do best: analyze the heck out of every micro-second of a trailer! What did you catch in the trailer?